Hi there! My name’s Fiona and I’m so excited to meet you. 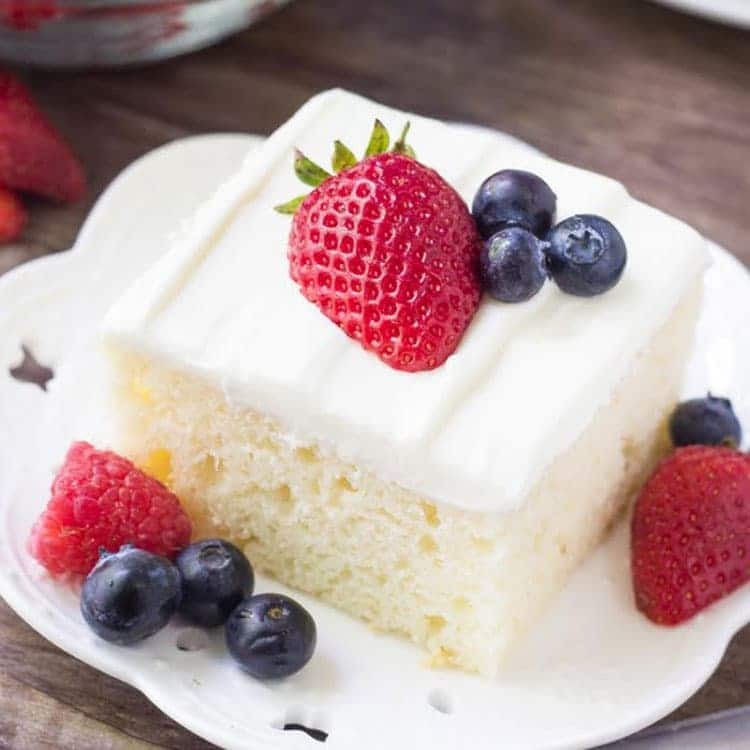 I blog over at Just So Tasty, and starting this month I’m going to be stopping in here on All She Cooks to share some of my favorite recipes – like this Berries and Cream Sheet Cake! I like baking, chocolate & everything delicious. So expect cakes, cookies, cupcakes, and other sweet treats. PS – I’m excited to meet you! Today we’re making this delicious berries and cream sheet cake. 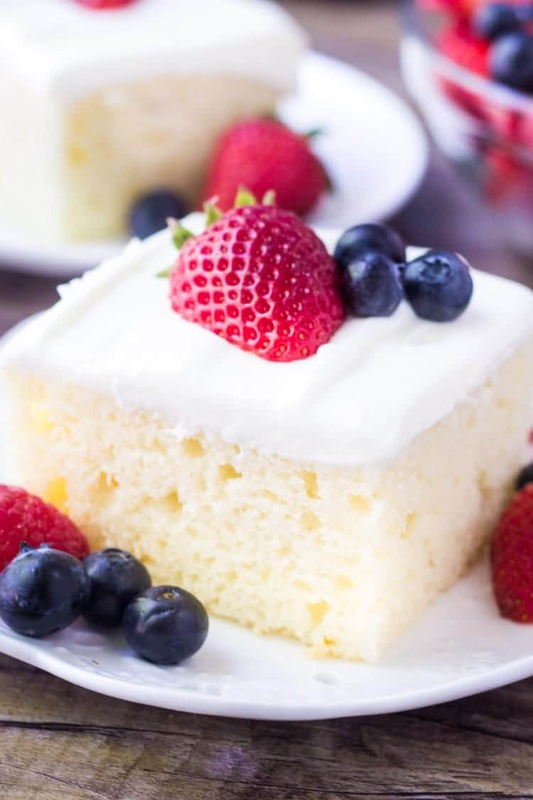 It’s a moist, super soft vanilla sheet cake frosted with a whipped cream topping and decorated with fresh berries. If you love strawberry shortcake, or fruit trifles – then this cake is for you. I love making sheet cakes because there’s less busy work than making layer cakes, and they’re perfect for bringing to summer BBQs or potlucks. Hello there long weekends! The vanilla sheet cake is a simple, no fuss, classic vanilla cake. It starts with real butter for lots of flavor. Then we’re using sour cream & milk to make the cake perfectly moist. Make sure your butter is softened and the eggs, sour cream & milk are room temperature before getting started. Then the cream topping is my favorite part. It’s a cloud of creamy, fluffy deliciousness that’s not too sweet and pairs perfectly with fresh berries. The flavor reminds me of my favorite cheesecake, only it’s lighter & fluffier. We simply beat together some cream cheese and a little powdered sugar, then fold in whipped topping. You could use whipped cream instead, but I find whipped topping holds up better to warm weather. Then serve each piece with fresh fruit, and we’re ready to go. 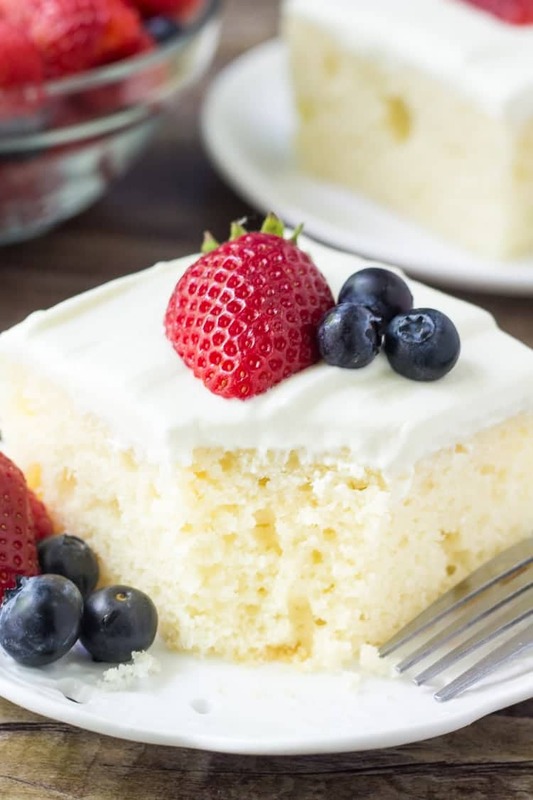 This berries and cream sheet cake is so perfect for summer, and the cream cheese whipped topping will be your favorite part. I absolutely love how easy the recipe is, and the fresh berries make our cake look so pretty. I hope you love this berries and cream sheet cake as much as I did! 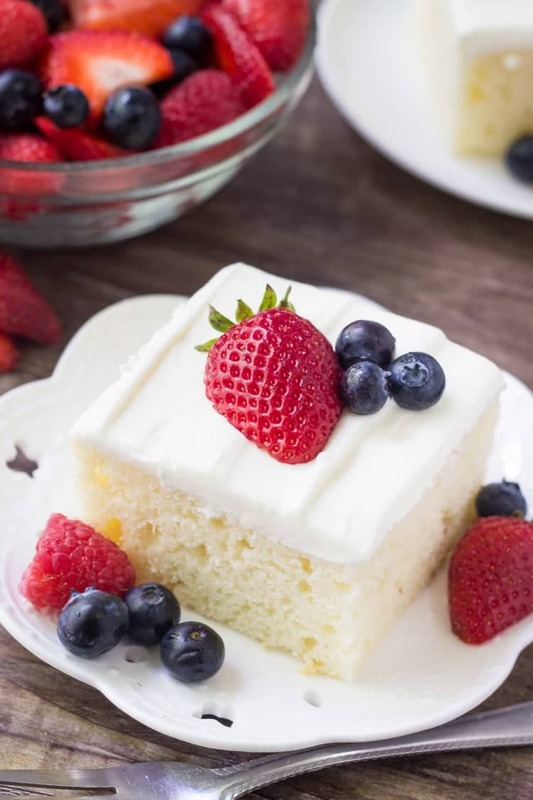 This berries and cream sheet cake is perfect for summer. It's a delicious vanilla sheet cake with a soft cake crumb. Then it's topped with a cream cheese topping & fresh berries. Preheat the oven to 350F degrees. Grease and flour a 9x13 inch baking pan. In a large bowl using a stand or hand held electric mixer on medium speed, beat together the butter and sugar until light and fluffy (about 2 minutes). Then mix in the eggs & vanilla. Turn the mixer down to low speed then beat in the sour cream. Then carefully beat in the flour mixture, and finally beat in the milk. Turn down the mixer and scrape down the sides of the bowl as necessary. Be careful not to over mix the batter. Pour the batter into your prepared pan and bake for 25-30 minutes, or until an inserted toothpick comes out clean. Allow to cool fully. In a large bowl beat together the cream cheese and powdered sugar until the mixture is smooth and there's no lumps. Then turn off the mixer and fold in the whipped topping using a large spatula until the mixture is an even color and consistency. Frost the top of the cake with the cream cheese topping. 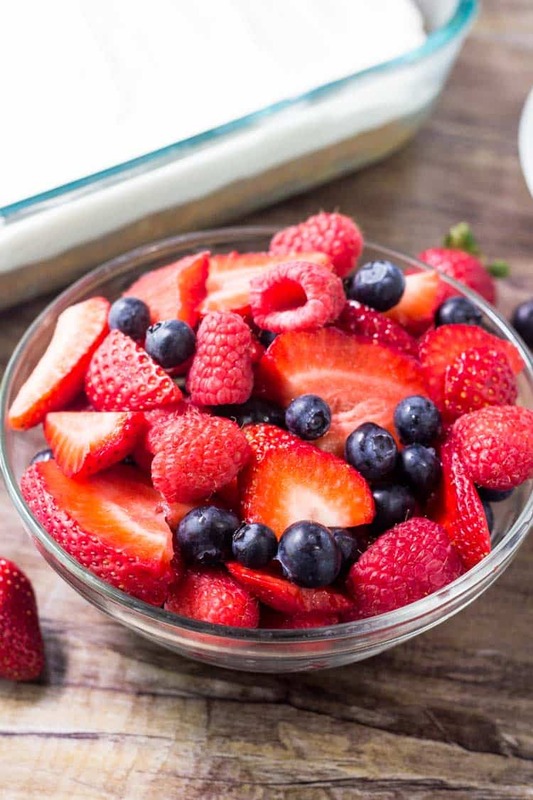 Cut the cake into pieces and top with fresh berries.